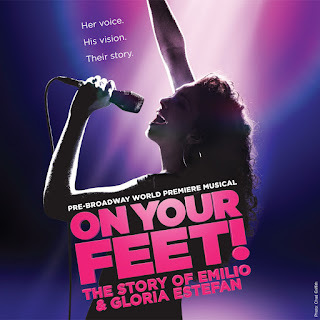 Last night we saw On Your Feet, the Broadway-bound musical that's premiering here in Chicago. It's the life story/love story of Gloria and Emilio Estefan. If you like her music (and I've been singing "Conga" to the cats all morning), you'll like this production. And Emilio wishes he's as hot as Josh Segarra, who plays him so adeptly. For me, the most interesting part of the evening was my friend Barb's reaction. She was only there because the show was part of our subscription series. As we were taking our seats in the first row of the loge, she said, "What is this again?" Barb, who is gloriously pop culture challenged, knew little or nothing about the Estefans. The 1990 bus wreck, which is an integral part of the show, was a newsflash to her. She liked the music, but it was clear that she was hearing some of the hits for the first time. "Which one is she?" Barb kept asking, squinting over the railing. "The one with her arm around the woman in the coral jacket." "I don't recognize her. What's she doing now?" "Taking a selfie with a woman in a black blouse." Then Barb dug her phone out of her purse, leaned waaaaay over the railing, and kept trying to focus on Gloria Estefan. Even though she didn't know which one was Gloria Estefan, even though she barely recognized any of Gloria Estefan's hits. Because Gloria Estefan is famous. * When The Last Ship and The Producers had their pre-Broadway runs in Chicago, Sting and Mel Brooks chose to watch from the wings.